If your order weighs less than 13 ounces, save huge on shipping with USPS first class (with tracking number). This product weighs 35.5 oz. Nature’s Sunshine’s Whole Leaf Aloe Vera Juice is a treasure trove of nutrients, like vitamins B1, B2, B6, C, niacina-mide, choline, and 18 amino acids. Nature’s Sunshine processes the aloe vera leaf in a way different from companies that claim their juice has lost its “disagreeable taste.” This method of over-processing leaves you with a product that is only, at best, 10 to 15 percent aloe vera. NSP removes the outer leaf that contains the intense cleanser, aloin, and collects the 100 percent pure liquid that flows from the gel found in the inner leaf. Nature’s Sunshine removes only the intense cleaning components, leaving a high level of mucopolysaccharides (7,000 mg per liter). Nature’s Sunshine’s Whole Leaf Aloe Vera contains a small amount of sodium benzoate, as a preservative, to prevent bacterial contamination. Whole Leaf Aloe Vera can be taken internally with juice or water, as well as used externally and may tone or moisturize the skin. 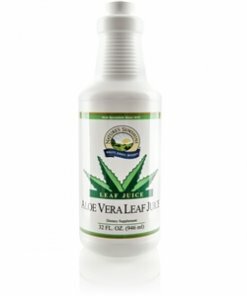 Instructions: Mix 1 ounce of Whole Leaf Aloe Vera with a glass (8 ounces) of Nature’s Spring water or your favorite fruit or vegetable juice four times daily. 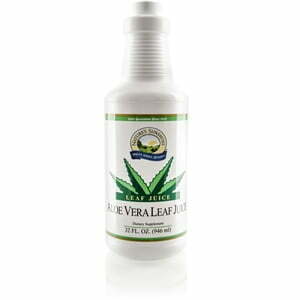 Whole Leaf Aloe Vera can be used directly from the bottle for use on the skin. Potassium sorbate and sodium benzoate (as preservatives).